For Dry & Damaged Hair! Enriched with Organic Shea Butter, Abyssinian & Macadamia Oils for a richly hydrating experience, this creamy conditioner provides the deepest of nourishment for dry hair. Working to repair damage, lock in moisture and strengthen; hair is left smooth, soft and healthy. All A kin shampoos and conditioners are silicone free. 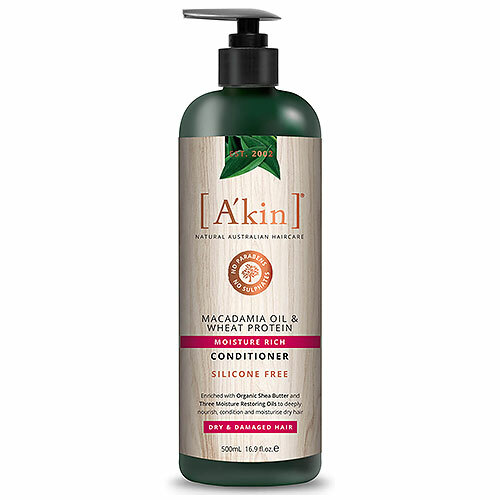 After shampooing with A kin Moisture Rich Wheat Protein Shampoo, massage a generous amount into wet hair and scalp. Rinse thoroughly. Below are reviews of A kin Macadamia Oil & Wheat Protein Conditioner - 500ml by bodykind customers. If you have tried this product we'd love to hear what you think so please leave a review.